Joey had an anxious Thanksgiving. True, we had out of town guests — but they weren’t total strangers. We also had company for dinner. This was not unusual and Joey was familiar with the guests. There were no strange noises. No fire in the fireplace. No exotic handouts from the table. Just Joey, shaking as if he were chilled, sitting stiffly and slightly hunkered. He never went into panting, but he did hide in the master bedroom closet. He didn’t seem much interested in food. These days, I reach for his Thundershirt when he gets like this. The Thundershirt wraps snugly around him and fastens with Velcro. It’s like swaddling a baby for security. It provides “gentle, constant pressure,” according to the website, adding that 80% of the dogs who use it show significant improvement in symptoms of anxiety. Animals experts such as Dr. Temple Grandin believe that the pressure calms the nervous system. The results aren’t dramatic, but they are observable. Over Thanksgiving, Joey wore his Thundershirt about 36 to 48 hours straight. When company left and life returned to its normal patterns, I took the shirt off. The anxiety is gone — for the moment. I try to anticipate when something will be happening that may upset Joey and put the shirt only him before the anxiety-producing event happens so he doesn’t become anxious at the sight of the shirt. For example, if I plan to make a fire in the fireplace, I’ll put the Thundershirt on Joey before there are any signs of fire preparation. He seems to welcome the shirt. He sits calmly while I wrap it around him. In the face of a terrified dog with no discernable reason for the terror, it’s nice to have at least one option available. While the vet suggested that maybe we’d need to consider a sedative at some point, wearing a Thundershirt has no lasting chemical effects or complications. 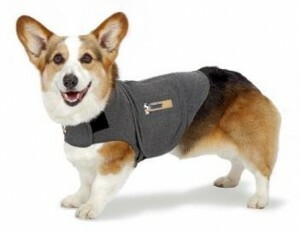 A Thundershirt costs about $40 and comes in a plain heather gray or rugby stripes in either navy or pink.